Greyson and I went to Brasil for a day. Well, we went to a Brasilian grocery store in Queens, which is about an hour away door-to-door by subway from Park Slope. I've heard there are bigger and better Brasilian grocery stores in Newark, New Jersey, but that's too far away from us for a grocery trip since we don't have a car. I love that in New York, you're just a train ride away from another country. When Greyson is older, I think it will be so fun to make a day out of visiting ethnic neighborhoods, eating the foods, meeting people and discovering things about those cultures. So, the motivation to trek out to Queens came to me after emailing my Brasilian mãe last week. 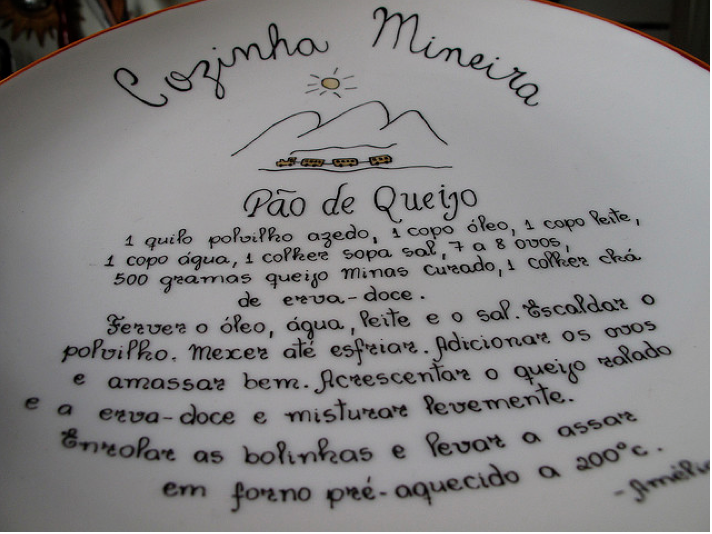 I remembered her delicious pão de queijo (cheese bread), which she made for me when I visited her family in Belo Horizonte in 2008. 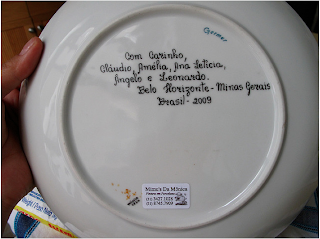 When I got married in 2009, she sent me her recipe painted on a plate. So cute and creative, right? Well, I never made the bread! I got all the ingredients back then, but I ate all the Brasilian cheese before I had a chance to make the dish! Click to continue reading about our field trip. Reusable coffee filter: They used one of these at the place I worked at in Brasil. I thought it was gross because after you use it once, it looks like a dirty diaper, but it's another nostalgic thing for me. Cocado com maracujá: I've never seen this brand Brasil Caipira, but this coconut passionfruit thing caught my eye. It wasn't very good, though. So, now I'm ready to make pão de queijo! Let's see if this gringa can make an OK batch. If you ever want to check out a Brasilian grocery store, Rio Bonito in Queens is easily accessible by subway. Just get off N train at the 36th Street station in Astoria and walk two blocks! We've been enjoying lots of Brasil lately. My parents were in Brasil two weeks ago and they sent me some baby books written in Portuguese (see below). I was so excited to read them to Greyson! you'll see the home made is better than the frozen one... Remember you took tons of pictures of mom doing pão de queijo at our home in BH? About the cheese, remember to let it "heal" (curar). Probably the one you got is too fresh and flavorless than the ones used at Forno de Minas. To make it more cheesy flavored, add some grated parmeson cheese (2 spoons may be enough). Ps. 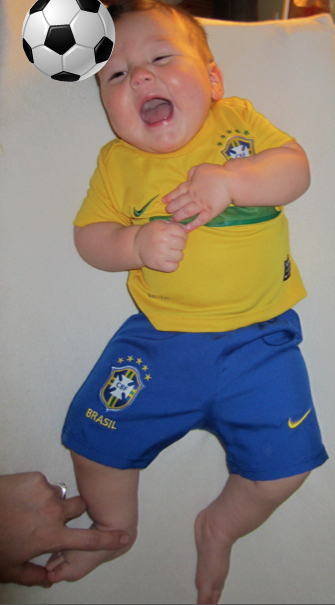 : Greyson looks like a real champion using the seleção uniform! Cutest!